BILLINGS — Unusually high water flows in the Bighorn River this spring made trout fishing tough for the average angler, but they are starting to reveal a silver lining for the fishery in general with the arrival of August. 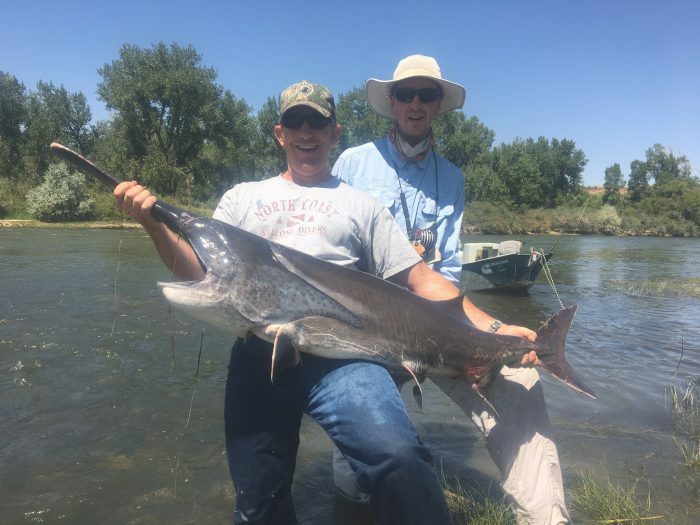 During the past week, anglers and fishing guides on the world-famous trout stream southeast of Billings have reported seeing paddlefish – the monstrous, prehistoric native fish normally relegated to the Missouri and lower Yellowstone rivers. Montana Fish, Wildlife and Parks fisheries biologists say that this summer’s arrival of paddlefish in the upper 13 miles of the Bighorn River is unusual, but not surprising nor unprecedented. Mike Ruggles, FWP’s fisheries biologist in Billings, said the timing, duration and temperature of releases from Yellowtail Dam into the Bighorn River this past spring look familiar to paddlefish and other species that normally migrate upstream each spring to spawn. Those flows have been absent, however, since the dam was completed in 1967. Bighorn Reservoir, which is backed up by Yellowtail Dam at Fort Smith, is filled every spring from snow melting in the mountains of northwestern Wyoming. The federal Bureau of Reclamation monitors snowpack all winter and adjusts the lake level to accommodate the anticipated runoff. Historically high amounts of snow fell in the Wyoming mountains last winter, so Bureau of Reclamation dam operators opened the dam’s gates early in March to drain the lake and make room for a huge runoff. After hovering around 2,500 cubic feet of water per second all winter, the river level shot up to more than 14,000 cubic feet per second by Memorial Day. That amount of water cannot pass through the electricity-generating turbines so, much of it was spilled through the dam. Water that flows through the turbines comes from near the bottom of the lake, where it sees no sunshine and is cold. Spilled water comes from the sun-warmed upper layer of the lake. Paddlefish have learned over eons and hundreds of generations that when the first surge of spring runoff starts in March, as prairie snow melts, it time to head upstream to look for a place to lay their eggs, Ruggles said. They spawn in late June and July when a runoff surge from mountain snowmelt arrives in the flatlands. This spring’s early, large releases from Yellowtail Dam apparently mimicked normal runoff flows and got paddlefish moving upstream. Flows were high enough – and apparently timed perfectly – to allow paddlefish to swim upstream over instream irrigation diversion dams and keep swimming up the Bighorn River. FWP Regional Fisheries Manager Ken Frazer said that, though a paddle fish was the biggest fish ever caught in Montana — 142.5 pounds and nearly 6.5 feet long – their arrival in the Bighorn River won’t harm trout fishing on the famous 13-mile trout-fishing stretch. Paddlefish feed exclusively on single-cell plankton, which they filter from the water. That makes it extremely unlikely that an angler would accidently hook a paddlefish while casting a fly for trout. Paddlefish may have been in the Bighorn River for a month or more, Frazer said, but water levels just now are receding enough that guides and anglers can see them in the deep holes. Don’t expect to see paddlefish take up long-term residency in the Bighorn River, Ruggles said. As the Wyoming snowpack melted out in late July, releases to the river from Yellowtail Dam dropped to around 4,000 cubic feet per second. And on Aug. 2 dam operators started drawing water from the lower levels of the lake. In two days, peak water temperatures in the river dropped from an unhealthy 67 degrees each day to 59 degrees. They now are running at between 62 and 64 degrees, a level comfortable for trout but too cool for paddlefish. In the next few weeks the paddlefish will migrate back downstream to their fall and winter home in the Missouri River in North Dakota, Ruggles said. Fry from any eggs that hatch in the Bighorn also will drift downstream, potentially as far as Lake Sakakawea. \For a time, paddlefish have arrived in the Bighorn River trout waters and people should enjoy seeing them while they can. But FWP’s biologists and game wardens want people to leave the fish alone. Handling paddlefish or lifting them out of the water is harmful and potentially illegal.